The American Alliance of Museums sent the following email on April 28, 2014. On April 10, President Obama announced Dr. William “Bro” Adams, president of Colby College, as his choice to serve as Chairman of the National Endowment for the Humanities. Two months earlier, on February 12, Obama announced Dr. Jane Chu, president and CEO of the Kauffman Center for the Performing Arts in Kansas City, as his choice to serve as the next Chairman of the National Endowment for the Arts. These two nominees must now be confirmed by the U.S. Senate. Take two minutes to ask the U.S. Senate to confirm Dr. Adams and Dr. Chu today! “Dr. Adams will bring a vast array of experiences to the National Endowment for the Humanities, including as a First Lieutenant in the U.S. Army during the Vietnam War and as president of Colby College, home of the AAM-accredited Colby College Museum of Art,” said Alliance President Ford W. Bell. Please urge the U.S. Senate to confirm these nominees swiftly so these talented leaders can get right to work supporting our nation’s cultural and educational treasures. “These two accomplished leaders will be terrific additions to the cultural landscape in Washington, DC and I urge the U.S. Senate to confirm them without delay,” said Bell. Read Ford Bell’s complete statement on President Obama’s nominees to lead NEA and NEH. Since the December 2012 departure of Chairman Rocco Landesman, NEA has been led by Acting Chairman Joan Shigekawa. Since the May 2013 departure of Chairman Jim Leach, NEH has been led by Acting Chairman Carole Watson. 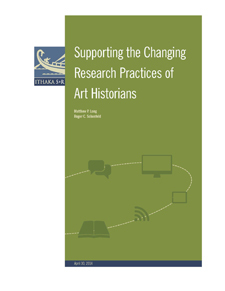 Read the American Alliance of Museums’ issues briefs on NEH and NEA. Elaine Wilson is an artist and a former colleague of the deceased at Washtenaw Community College in Ann Arbor, Michigan. Frederick Horowitz, an artist, art educator, writer, and passionate champion of the work and teaching philosophy of Josef Albers, died on September 12, 2013, in Ann Arbor, Michigan. He was 75 years old. The 12 x 18 inch newsprint pad in which Horowitz did many of the exercises for this class is preserved today, signaling the importance he placed on his experience in this course. Horowitz spent thirty-five years teaching drawing, design, color, and art appreciation at Washtenaw Community College in Ann Arbor. He was widely respected in southeast Michigan as a teacher with authority and integrity. He mentored countless students who went on to become artists, transferring to four-year art programs around the country. Many of his students were older individuals whose lives were deeply enriched by his courses. At Washtenaw Horowitz taught the art-appreciation course and wrote More Than You See: A Guide to Art (San Diego: Harcourt Brace Jovanovich, 1985) for use in it, while also widening the book’s scope for a broader audience. More Than You See departs from many textbooks for art appreciation and art history: instead of presenting artworks in a chronological order or grouping them by “ism,” it presents a series of questions about looking at a wide range of paintings and objects without necessarily providing the answers. These questions continually challenge readers to think for themselves. One chapter, titled “Looking over the Artist’s Shoulder,” compares and contrasts an Italian Renaissance painting, Guercino’s Esther before Ahasuerus (1639) and the preparatory drawings for it, with a miniature painting from India and its preparatory drawing. Another chapter, “Reading Paintings,” examines the formal characteristics of several works of art. Horowitz was especially interested in process and in the artist’s choices. By including works from the museums and galleries close to his school, such as the University of Michigan Museum of Art and the Detroit Institute of Arts, he tied the book to the experience of his students whom he regularly took to these institutions to see the real thing. In 1992 Horowitz began thinking about writing a book on Albers’s teaching. Brenda Danilowitz, chief curator at the Josef and Anni Albers Foundation in Bethany, Connecticut, worked with him and coauthored the book. Horowitz interviewed numerous artists who had studied with Albers, asking them about the teacher’s presence in the classroom and studio and about the impact and import of the particular projects he assigned. Research at the archives of the Bauhaus, Black Mountain College, Yale University, and the Albers Foundation yielded a rich trove of material, which Horowitz and Danilowitz eventually worked into Josef Albers: To Open Eyes. This groundbreaking book has already changed the teaching of numerous younger artists and art professors, reinvigorating their work in the studio classroom. While writing To Open Eyes, Horowitz began two courses—on design and on color—at Washtenaw Community College, putting into practice the ideas he was acquiring from his research. His own experience taking the color class at Yale with Albers’s own student, Sewell “Si” Sillman, meant that he was well prepared. As a teacher Horowitz was disciplined and demanding, a tough but kind critic and grader. He required a great deal from his students, but when he saw a need to mentor and foster the talent of particular individuals he went above and beyond his regular duties to help them. This approach led to developing personal relationships that would last well beyond their time at Washtenaw. Horowitz’s mentoring did not stop with students. He routinely worked with the part-time faculty that he recruited to teach many sections of the studio-art and art-appreciation classes, discussing with them course assignments and curricula, student behavior, grading policy, and even their students’ artwork. He created an atmosphere of cooperation and collegiality within the college’s art area that made it a laboratory for good teaching, a unique place for the overworked and underpaid instructors to work in. He was honest and generous with everyone, while holding all to his own high standards. 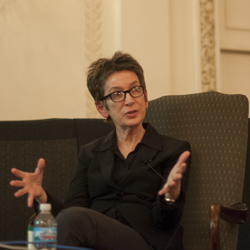 After retiring from Washtenaw Community College in 2003, Horowitz continued to lecture around the country and give workshops on Albers and on color and design (including presentations at the Foundations in Art: Theory and Education conference in 1997 and 2003 and at Black Mountain College Museum and Art Center in Asheville, North Carolina.) Abroad he taught workshops at art schools in Mexico City and Jerusalem. Horowitz’s recent research at the Albers Foundation included close examinations of several Homage to the Square paintings. He developed his thoughts into a manuscript, now awaiting publication. This text—unlike any other of which I know about this body of work—looks closely at how Albers’s color choices interact with each other in specific ways; it also describes poetically their effect after extended looking. Most people don’t spend the amount of time in front of these works to have the experience Horowitz recounts, but hopefully more of them will. In addition, Horowitz speaks about Albers’s color course in the new digital format of the artist’s influential book Interaction of Color (New Haven: Yale University Press, 2013. He was also part of a new online art-appreciation course being developed at Washtenaw Community College. At a memorial celebration of Horowitz’s life at Washtenaw in late October 2013, family, friends, and colleagues remembered him as deeply humane, curious, warm, devoted to his family, funny, and generous with his time, intellect, and heart. He leaves behind a trail of people who loved him and a host of younger artists who, thanks to his inspiration, are devoted to teaching well. In its periodic list of obituaries, CAA recognizes the lives and achievements of the following artists, historians, teachers, curators, dealers, philanthropists, and others whose work has significantly influenced the visual arts. Ira Eduardovna. Vox Populi, Philadelphia, Pennsylvania, January 3–26, 2014. Mother. Video. Stacy Leeman. Sharon Weiss Gallery, Columbus, Ohio, March 2–30, 2014. Hidden Presences. Painting. Blane De St. Croix. Fredericks and Freiser, New York, May 1–June 14, 2014. Dead Ice. Sculpture. Lauren Kalman. Sienna Patti Contemporary, Lenox, Massachusetts, February 8–April 6, 2014. But if the Crime is Beautiful … Part 1, Composition with Ornament and Object. Fine art and contemporary craft. Linda Stein. Rebecca Randall Bryan Art Gallery, Coastal Carolina University, Conway, South Carolina, January 15–February 28, 2014. The Fluidity of Gender: Sculpture by Linda Stein. Sculpture. Kent Hayward. 7 Dudley Cinema, Beyond Baroque Arts Center, Venice, California, April 27, 2014. Retrospective of Filmmaker Kent Hayward’s Work. Experimental and documentary film. Katie Herzog. Monte Vista Projects, Los Angeles, California, February 15–March 9, 2014. Altered State Library. Painting. 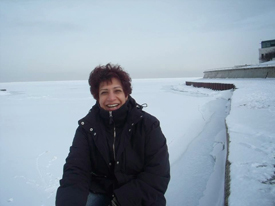 Kanwal Khalid was a participant in the 2014 CAA-Getty International Travel Grant Program. A professor of fine arts at University of the Punjab in Pakistan, she specializes in the history of South Asian art and design with a particular focus on miniature painting in nineteenth-century Lahore. Khalid is also a practicing miniature painter and former curator of paintings at the Lahore Museum. Below she describes her experiences at the 102nd Annual Conference in Chicago. Just when you think you have seen it all, something turns up and surprises you with its novelty and magnitude. The College Art Association did just that when I attended its Annual Conference in Chicago last February. For me, it became more than attending a conference; it was the experience of a lifetime that changed many of my perspectives. In Pakistan, art history has always been part of the academic study of fine arts, but now it has become an independent discipline in its own right. This is a relatively recent development, of which I have been a part, and art history is enjoying a high status for the first time in the history of Pakistan. But still it is a comparatively new field. When I came to the Chicago conference, it was a complete surprise to realize that thousands of people share the same passion. CAA and the Getty Foundation have caught a tiger by the tail that is growing fast and expanding everywhere. The chill of Chicago and the layers of snow couldn’t mar the fiery passion of the scholars, students, artists, and art historians participating in the conference. Interactive sessions, exhibitions, bookstalls, art-supply booths—this was a completely magic world for me. To breathe in thoughts and objects that are the passion of my life was a real treat. Another dimension of knowledge was listening to presentations by the other nineteen recipients of CAA’s International Travel Grant Program and realizing what wonderful work was going on in their countries regardless of all the challenges they face on daily basis, very similar to the situation in my own country. Outside the grandeur of the Hilton Hotel, it was the world of museums and modern architecture. I really liked the friendly size of museums in Chicago, which were not as overwhelming as other institutions I have visited, where there’s always a sense of missing a lot even after seeing so much. In all the museums that I visited in Chicago, I was able to return to many of my favorite galleries more than once during the week. And then a bad snowstorm hit just as we were departing Chicago for New York. Our destination was the Sterling and Francine Clark Art Institute in Williamstown, Massachusetts, and I will not be exaggerating if I call it a researcher’s paradise. The library was a dream-come-true. The best part for me was being surrounded by mountains—the Berkshires were an enchanted land containing everything I could desire. Here, we raised questions, made suggestions, and challenged old concepts in a true scholarly approach. The time passed too quickly, and we were saying goodbye to each other at Penn Station in New York City, with a hope that someday we will meet again. I traveled south to give a lecture in Delaware and then attend a meeting in Washington, DC. My experience at CAA turned out to be a great asset for these events, where I imparted my knowledge of South Asian art and culture with more confidence and vigor, especially during a briefing to the South Asian desk at the US State Department about the contemporary educational and cultural situation of Pakistan. CAA’s 2014 Annual Conference was a life-changing event. Now I’m more confident about my research and teaching methodology because a comparison with other approaches helped me improve my own ways of doing things. I’m so very much looking forward to attending the conference next year. After returning to Pakistan, I have talked with my students about the potential and scope of CAA and to encourage them to become members. This will give them an exposure to a world of dedicated art historians, enthusiastic academicians, and talented artists, with endless opportunities for those who have the judgment and ability to take advantage of them. Christine Hahn has earned tenure in the Department of Art and Art History at Kalamazoo College in Kalamazoo, Michigan. David Joselit has left Yale University in New Haven, Connecticut, for a new post as Distinguished Professor of Art History at the Graduate Center, City University of New York. Darby English, director of research and academic programming at the Sterling and Francine Clark Art Institute in Williamstown, Massachusetts, has been appointed consulting curator in the Department of Painting and Sculpture at the Museum of Modern Art in New York. He will retain his position at the Clark. Sandra Q. Firmin, curator of the UB Art Galleries at the University at Buffalo, State University of New York, has accepted the directorship of the CU Art Museum at the University of Colorado in Boulder. David Rubin has left his curatorial position at the San Antonio Museum of Art in San Antonio, Texas. Jill Deupi has joined the board of directors of the Association of Art Museums and Galleries as its New England representative. Jessi DiTillio has been appointed interim administrative director of the Association of Art Museums and Galleries. Reni Gower of Virginia Commonwealth University in Richmond has been reelected to the Southeastern College Art Conference’s board of directors for a three-year term. Sandra Reed of the Savannah College of Art and Design in Savannah, Georgia, has been reelected to the Southeastern College Art Conference’s board of directors for a three-year term.